Vala is a start-up that provides international money transfer services in a Saas B2B model. Their customers consist of money service businesses that provide international remittance services. Vala integrates their system into their customers’ shops and gives them access to money transfer contracts. Vala is currently in the stage of designing the two main components of their product: a web-app dashboard used by the operators (sellers), and a phone app used by the senders. This project focuses on the design and functionality of the dashboard. The Research Plan was created in order to help define the needs and goals of the end users for the dashboard, the money exchange center tellers. First, secondary research was completed for me to learn more about the market space. 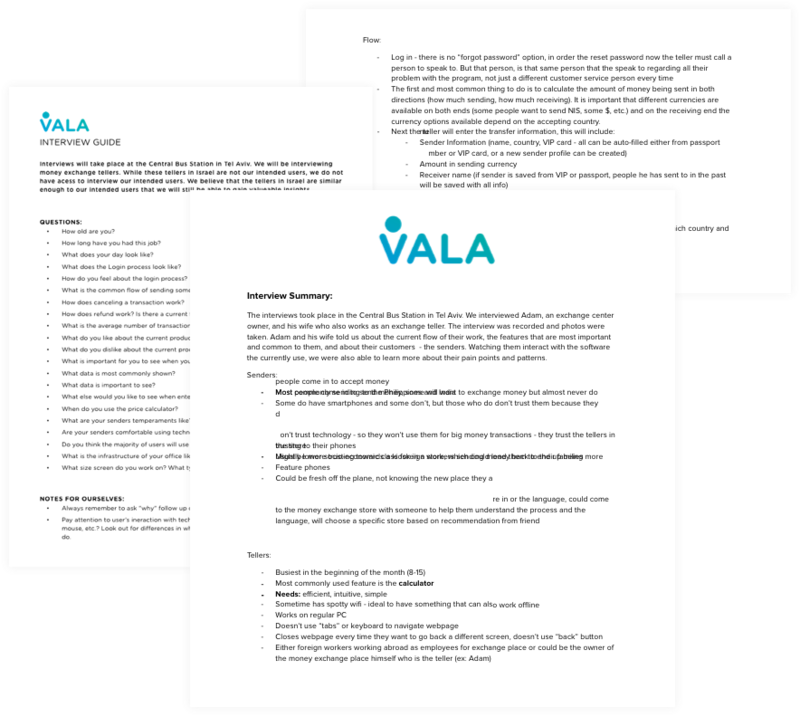 This included discussions with the Vala team to understand what they know about their customers, as well as research on existing competitors. Once I had an understanding of the international remittance field, I conducted interviews with current money exchange center teller to hear and see first how how these users interact with their clients and existing software. The features and requirements of the doashboard are quite complex. 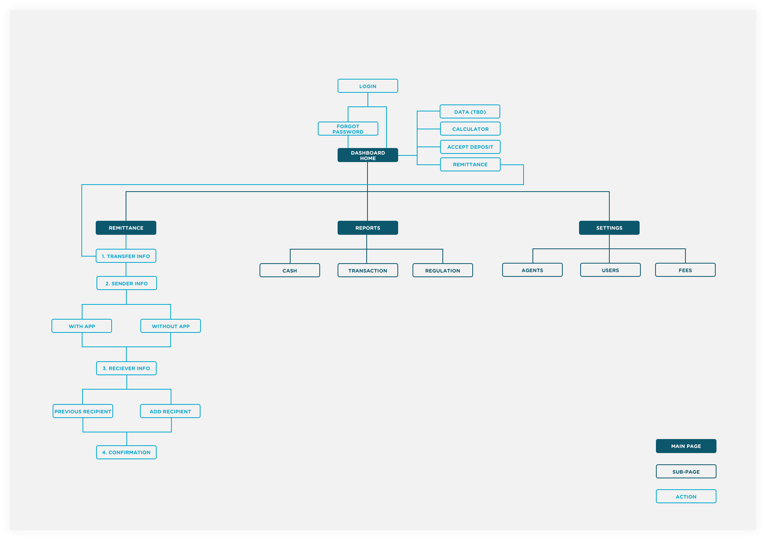 An app map was created in order to outline and organize the flows throughout the webapp. Together with Vala's Product Manager, I created Use Cases. The Use Cases clearly outline all the steps necessary to complete key actions. 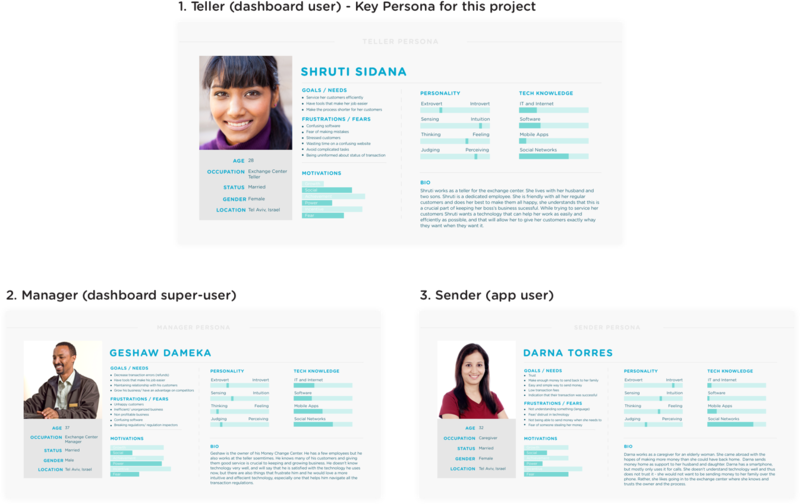 This deliverable helps ensure that no steps get left out when creating wireframes. 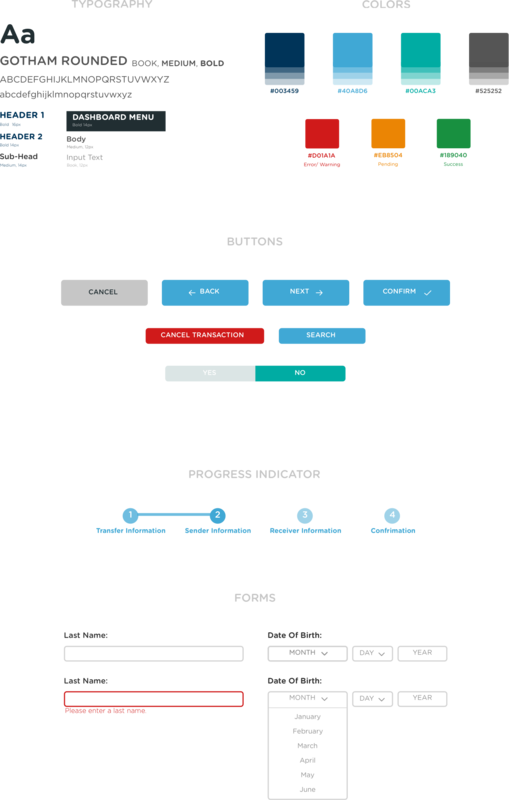 The Use Cases and Wireframes were created for the flow of completing a remittance transaction and then canceling that transaction. 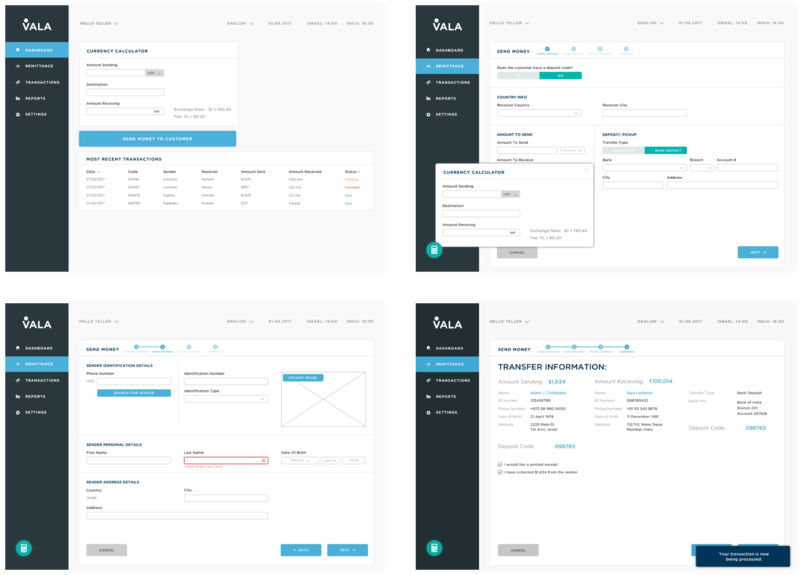 After many rounds of reviews and iterations with the Vala team color and style were applied to the wireframes to produce a full product mockup. A UI Kit was created the outline the style guides for the dashboard. With this flow, Vala has the necessary bones of the dashboard to go live with their product. The next steps are to replicate and adapt the templates and styles created to all the remaining pages of the dashboard including; Data Reports, Administration & Fee Settings and Branch Management. After launching the product we intend to install analytic tools which will allow us to better understand users' behaviors and needs. Additionally we will be making cyclical iterations in order to continuously improve the product.